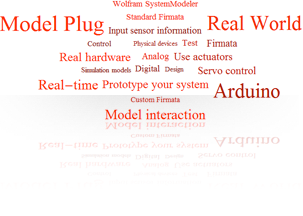 The Wolfram ModelPlug library allows you to link your simulation models to the real world by the use of an Arduino board (or any other board following the Firmata protocol). ModelPlug opens up a wide variety of ways to interact with your models, for example by using buttons, switches, input sensor information or even actuators such as motors and servos. Supports interaction with models through buttons, switches, knobs, etc.